Water and soda, plus any combination of carbonated and non-carbonated flavors. 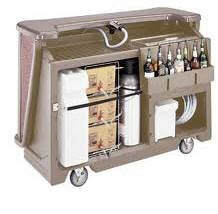 Also dispenses wine, juice, or non-carbonated pre-mix flavors. Choose 1 or 2 buttons for regular and diet energy drinks. Non-electrical mechanical operation provides excellent reliability. Dispense up to 10 carbonated and non-carbonated post mix flavors (includes seltzer and water). Stylish all stainless steel design provides ease of operation. Ideal for waitress stations, kitchen service areas, homes, portable drink carts, employee break areas, stadium service areas, racecar trailers, wherever drinks are served! Carbonator Rental's exclusive post-mix system that requires No Electricity or Water Connection! You can have this system installed virtually anywhere.